Have you ever attended a conference and wished that you could access your customized schedule, conference map and speaker bios from one device? 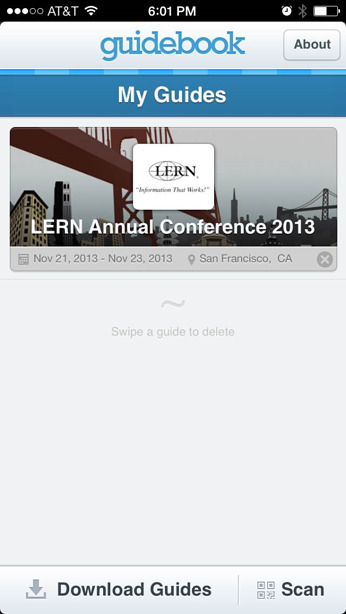 Well, now you can with the LERN Annual Conference mobile app. The app is compatible with iPhones, iPads, the iPod Touch and Android devices. If you have a Windows Phone 7 or a Blackberry, you can access the same app by going to m.guidebook.com from your mobile phone. Voila! You should have the app and be ready to roll. With the app, you can add sessions to your personal schedule, interact with other conference goers via social media and even rate the sessions you've attended. Because we know you'll be busy learning, networking and enjoying San Francisco, the LERN Annual Conference mobile app allows you to create a conference to-do list so you can remember all the goals you set for yourself.